The mayors of San Diego and Tijuana said Monday they are committed to cross-border collaboration despite rising political tensions between the United States and Mexico. 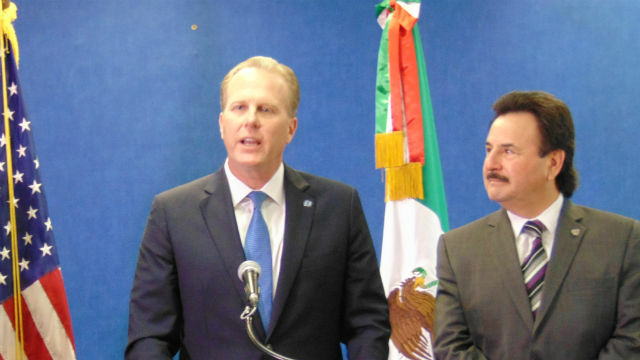 San Diego Mayor Kevin Faulconer and new Tijuana Mayor Juan Manuel Gastélum met in Faulconer’s office and then addressed press from both sides of the border. Faulconer repeated his remarks in Spanish, then turned the podium over to Gastélum, who has been in office for just two months. The meeting comes less than a week after President Donald Trump apparently suggested in a call with Mexican President Enrique Peña Nieto that the United States might use its military to control drug cartels in Mexico. Both leaders later denied that was the intent. Trump has also begun extending the wall between the two countries, and has vowed to renegotiate or terminate the North American Free Trade Agreement, on which business on both sides depend. The two mayors plan to renew a memorandum of understanding in the next few weeks spelling out how the two municipal governments will cooperate. Department directors of the two cities meet frequently under the current agreement. Former mayor and now Chamber of Commerce CEO Jerry Sanders described San Diego and Tijuana as a “model cross-border region” with a combined $230 billion economy. He noted that chamber members would soon make their 12th annual trip to Mexico City to reinforce the bi-national relationship. Nikia Clarke, executive director of the World Trade Center San Diego, said manufacturing processes are tightly integrated between the two cities, with products passing back and forth multiple times during assembly.